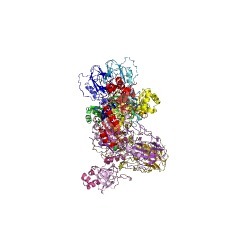 This domain represents subunit 2 of allophanate hydrolase (AHS2). Urea carboxylase (UC) catalyses a two-step, ATP- and biotin-dependent carboxylation reaction of urea. 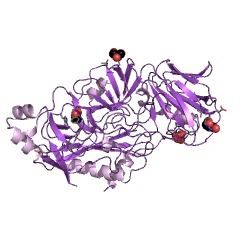 It is composed of biotin carboxylase (BC), carboxyltransferase (CT), and biotin carboxyl carrier protein (BCCP) domains. The CT domain of UC consists of four subdomains, named A, B, C and D. This domain covers the A and B subdomains of the CT domain. 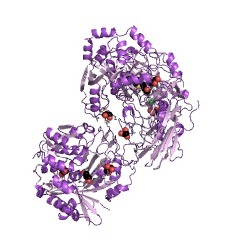 This domain covers the whole length of KipA (kinase A) from Bacillus subtilis [(PUBMED:9334321)]. It can also be found in S. cerevisiae urea amidolyase Dur1,2, which is a multifunctional biotin-dependent enzyme with domains for urea carboxylase and allophanate (urea carboxylate) hydrolase activity [(PUBMED:20884691)]. 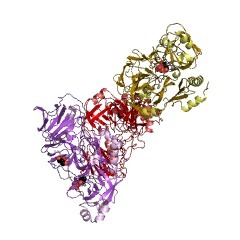 KipA forms a complex with KipI, which is covered by the C and D subdomains of the CT. 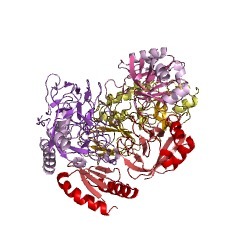 The KipI-KipA complex shares protein structure and sequence similarity with the CT domain of urea amidolyase from K. lactis, but residues that are important for CT catalysis are not conserved in KipA and KipI. Therefore, the KipA-KipI complex is unlikely to have CT activity [(PUBMED:22869039)]. 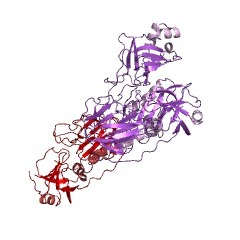 The CT domain is homologous to the Thermus thermophilus protein TTHA0988 (Q5SJM0). However, the subdomain order of TTHA0988 is different compared with that of CT, suggesting distinct fusion events in the evolution of these proteins [(PUBMED:22277658)]. There are 16279 AHS2 domains in 16279 proteins in SMART's nrdb database. Taxonomic distribution of proteins containing AHS2 domain. This tree includes only several representative species. The complete taxonomic breakdown of all proteins with AHS2 domain is also avaliable. Click on the protein counts, or double click on taxonomic names to display all proteins containing AHS2 domain in the selected taxonomic class. This information is based on mapping of SMART genomic protein database to KEGG orthologous groups. Percentage points are related to the number of proteins with AHS2 domain which could be assigned to a KEGG orthologous group, and not all proteins containing AHS2 domain. Please note that proteins can be included in multiple pathways, ie. the numbers above will not always add up to 100%.